Why i am Best ? LeoStar horoscope software contains all aspects of astrology with comprehensive Calculations, Remedies, Predictions, Various Vedic Charts, Teva, Dashas, Matching, Varshphal, Numerology, Horary, K.P, Lalkitab, Muhurat, Panchang, Mundane, Books, Calendar, Transit, Mantras and lots of other useful information. This horoscope software is available in more than 12 languages including Hindi and English. Leostar horoscope software is available in Home, Standard, Plus, Professional Versions & Modules (all packages separately). In this horoscope software several horoscopes can be viewed and matched simultaneously on one single screen. This horoscope software enables to view and use Varshphal, KP calculations and Muhurats simultaneously on one screen. Based primarily on Parashari however, Jaimini, Lal Kitab, KP and Horary astrology has also been incorporated in this horoscope software. Leostar horoscope software has its own data bank containing birth details of thousands of celebrities which can be used for research and comparative study. 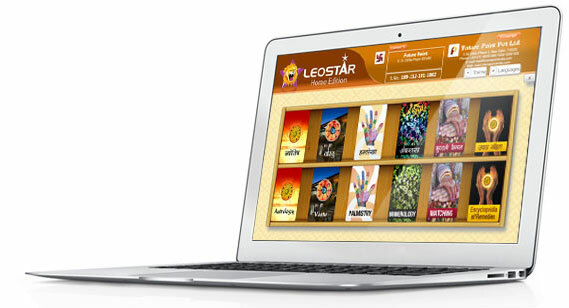 Leostar is the only horoscope software comprising the facility of comprehensive printing. Trust of more than 30 years. Pioneer of Astro world/first widely accepted software from early 1980's. Lakhs of satisfied users & Astrologer are backing this software. Our software is known for its accuracy and credibility. Particularly foreign birth chart are inaccurate in most other software. Day light saving/Summer time and automatic war time correction. Longitudes and latitudes for one crore locations. Ease of operation, multiple horoscopes on one screen. Match multiple horoscopes on one screen. Comprehensive list of various charts. It has much more calculations and predictions like Sudarshan Chakra moving transit chart, annual & monthly predictions are excellent, complete gem selection Dasha wise, only software which gives Pitridosha analysis with its cause, effects and remedial measures, Rudraksha report with method of wearing & significance. Contains detailed Panchang calculations, no need to carry Panchang, even Panchang for 100 years can be printed. Most accurate gem recommendation software module is in Leostar Expert. The only software to give you accurate Muhurt for marriage. Only package to give you festival for any year of past or future. You can see the calculations as well as the prediction in different languages simultaneously. One can customize screen as per choice and need. Print Horoscopes in various sizes. It contains so many detailed software modules. Most popular hence fourth updated version. If we have a look into the history of Astrology Software Leostar we come to know that the initial version of it was developed in 1978 and launched in 1987 officially. Therefore the latest version of this software known as Astrology Software Leostar Expert is the result of extensive research work of 30 years which was repeatedly upgraded in the process with the continuous team work efforts of software professionals under the leadership of Shri Arun Kumar Bansal the man who created it and still he & his team is actively engaged in its further up gradation. The comprehensive list of the most attractive and unique features including accuracy in the calculations of intricate mathematics of astrology with universal acceptance earn maximum credibility to this software. Lakhs of satisfied users & Astrologers are backing this software. It is pioneer of Astro world/first widely accepted software from early 1980's Leostar is most popular hence fourth updated version. It contains so many detailed software modules. Leostar has earned the trust of more than 30 years which started with its very first and most accurate version Leo 99, Leo Gold, Leo Palm and now Leostar & Leotouch in which the latest is Leostar Expert. Particularly foreign birth charts are inaccurate in most other software. Leostar Expert is known for its accuracy and credibility as it gives streamlined facilities of Day light saving/Summer time and automatic war time correction thereby bringing the accuracy in horoscope casting, analysis & predictions. It contains comprehensive data bank with least possibilities of mistakes and errors. It is a great plus that it gives accounting facility with the option of saving various types of data. It is an excellent feature of it that it provides permanent backup for all things done. It gives Longitudes and Latitudes (i.e coordinates) for more than 1 crore locations. It supports various Ayanamsa with a facility to add user defined Ayanamsa. Leostar is user friendly and provides the facility of viewing several horoscopes on one screen simultaneously & this unique feature of multiple horoscopes on one screen creates ease of operation. You can match & compare multiple horoscopes on one screen & the facility to see the calculations as well as the predictions in different languages simultaneously is its added attraction. One can customize screen as per choice and need. One can print Janma Patrika in various sizes and apart from that it gives various models of horoscopes and therefore one can print the horoscope model of choice and requirement. The layouts of page can be designed in your own style as per choice. Expert Edition gives additional facility of printing horoscope in real book binding format in sectional form. Leostar Expert contains Prediction Master which gives the full facility to add your own prediction with additional convenience of editing the predictions thus added. Its option of different styles of charts like South Indian, North Indian, Oriya, Bengali and Western system also makes it a hot favorite globally. It also gives the option of using Neptune, Pluto and Uranus as planets in chart. It is an added advantage that this software is multilingual. Leostar Expert contains comprehensive list of various charts. It has much more calculations and predictions in it like Sudarshan Chakra moving Transit chart, Contains detailed Panchang calculations for next 10,000 years with accuracy of second, no need to carry Panchang, even Panchang for 100 years can be printed. Leostar Expert Edition gives Panchang calculations, reports and Festival Master Updating especially for Panchang makers. It also provides the facility of editing before printing. The moving transit chart can be used for the extensive use of those astrologers who wish to make global predictions for any year any month for next thousands of years. The Muhurat module of this software makes it hot favourite. It is the only software to give you accurate Muhurt for marriage. It provides auspicious Muhurats for all occasions like starting a business, ring ceremony, house warming, constructing house, performing Yagya and so on and so forth as the list is long. It is the only package to give you accurate festival date for any year of past or future. Leostar defines the formulae for the determination of date of any festival and fast so the accuracy level is unquestionably correct. Its annual, monthly & daily predictions are excellent. It supports all astrological systems and all aspects of astrology with comprehensive Calculations, All Astrological Combinations (Yogas), Various Remedial Measures, All Divisional Charts, Various types of Dashas, Parashari Astrology, Jaimini Astrology, Kundli Milan (Matching), Varshphal, Numerology, Horary, K.P, Lal Kitab, Muhurat, Panchang, Mundane, Books, Calendar, Transit, Mantras and lots of other necessary astrological information with Predictions. Special detailed packages on remedies like Gems, Rudraksha, Sadesati, Pitridosha, Daily- Monthly- Annual Predictions & others have been added. Complete Gem Selection Report - It is common problem that people get confused when different astrologers recommend different gems to the native. Whereas the gem selection software of Leostar Expert which is the research work of years not only recommends the correct gem but also gives the percentage wise benefit of each gem. It also follows the same percentage wise calculation process in Dasha wise gem selection. The Gem recommendation (Ratna Vichar) of Leostar Expert is widely accepted by all professional astrologers as it recommends the most appropriate gem always. It is the only software which gives detailed Pitridosha analysis with its symptoms, cause, effects, Grah Yoga and remedial measures. Its detailed annual, monthly & daily predictions which have been introduced for the first time are excellent. Special 3 page Rudraksha report contains comprehensive information about favourable rudraksha, wearing influence with importance effects for a particular native. It also gives Sadesati's detailed description and predictions in detail for all three cycles. Leostar gives comprenhensive predictions including Dashaphal, next 30 years predictions, varshphal charts with predictions and graphs. Leostar Beginner - Basic calculations. Leostar Home - Basic astrology & Basic matching calculations with predictions & remedies. Leostar Standard- Complete Astrology & Matching Calculations with predictions & remedies. Leostar Plus- All features of Leostar standard with one additional software module of choice. Leostar Varshphal- Complete astrology with Varshphal calculations, predictions & remedies. Leostar Lalkitab- Complete astrology with Lalkitab calculations, predictions & remedies. Leostar KP & Horary- Complete astrology with KP & Horary calculations, predictions & remedies. Leostar Numerology- Complete astrology with Numerology calculations, predictions & remedies. Leostar Muhurat- Complete astrology, predictions & remedies with Muhurat calculations. Leostar Panchang- Complete astrology, predictions & remedies with Panchang calculations. Leostar Professional- All above mentioned software are included in Leostar Professional. It caters the need of all professional astrologers therefore rightly named as Leostar Professional. Leostar Expert- This software is the ultimate and final updated software of Leostar series which contains all above given softwares in it and all features of Leostar which have been discussed in this article. All above given softwares except Leostar Beginner contain extra software modules of Teva, Tables and Mundane. One More software of Leostar series is Leo Forecast which is considered as best astrology software for predicting share market trends. Many other applications like Leo Query, Mantras, Books, Tarot & many other are extra features. Separate & best customer support with ammyy admin facility (for remote access). Complete astrology with Varshphal calculations, predictions & remedies. Complete astrology with Lalkitab calculations, predictions & remedies. Complete astrology with KP & Horary calculations, predictions & remedies. Complete astrology with Numerology calculations, predictions & remedies. Complete astrology, predictions & remedies with Muhurat calculations. Complete astrology, predictions & remedies with Panchang calculations. Expert Astrology Software with Prediction Master. In the horoscope made by this horoscope software not only the position of planets in houses can be analyzed rather the birth chart, Chalit chart, Dasha, Sarvashtak chart, Shadbal, Avakhada and various other charts used in making astrology predictions can be seen simultaneously on a single screen. This advantage of viewing many horoscopes together has made it easier to analyze an event. This horoscope software has its own data bank containing birth details of thousands of celebrities which can be used for research and comparative study. Leostar is the only horoscope software comprising the facility of comprehensive printing. In this horoscope software several horoscopes can be viewed and matched simultaneously on one single screen. Different Varshphal, KP calculations and Muhurats can be viewed and used simultaneously on one screen. This horoscope software is based primarily on Parashari however Jaimini, Lal Kitab, KP and Horary astrology has also been incorporated in it. This horoscope software supports all astrology Systems. Exhaustive Computations of Horoscope, Varshphal, Matching, Horary Analysis, Lal Kitab, Numerology, Muhurat, KP System and Panchang are detailled in this horoscope software. Horoscope software incorporates thousands of yogas. Horoscope software leostar supports various Ayanamsa with a facility to add user defined Ayanamsa. Horoscope software gives the facility to add the predictions made by you. Horoscope software provides permanent backup for all things done. This horoscope software gives the facility to keep the horoscopes can be kept in different categories like sportspersons, politicians etc for research work. Horoscope software leostar already contains birth details of more than 5000 celebrities like film stars, sports persons, politicians, world leaders, musicians and stalwarts of other fields. Horoscope software also gives the facility to change language as per choice. Horoscope software gives option of using Neptune, Pluto and Uranus as planets in chart. Horoscope software contains a data of longitude and latitude of 1 Crore cities. Horoscope software also gives facility of viewing many horoscopes at one time. Horoscope software gives detailed panchang with Lagan, Tithi, Nakshatra, Yoga, Karan, Rashi, Rahukaal, Bhadra, Panchak, retrogression, Gandamool. Facility of viewing many packages at one time with different tab is also incorporated in this horoscope softawre. This horoscope software also incorporates various tables like planets, gems, planet friendship, significator, yoga, Nakshatra- Gana/Nadi, Rashi-Vashya/Paya tables, Nakshatra-Lord/Alphabet tables, Hindu/Sikh/Jain festivals. From this horoscope software you can take printout or single /double side, make PDF file which can be emailed. All operations of this horoscope software are controlled on one screen. In horoscope software leoStar, you can customize the color and font style. This horoscope software contains all Indian calendar with Sunrise, Paksha, Nakshatra, Tithi. This horoscope software is easy to use, correct and capable of helping in making predictions by fast computations. This horoscope software gives analysis of finance and health on Daily, Monthly and Annual basis. Horoscope software leostar contains Various Calendars. This software for horoscope enable you listen various Mantras. Horary Tools such as Biorhythmic Chart and Tarot Cards are included in this horoscope software. Comprehensive study material on Astrology, Vastu, Numerology, Palmistry and Lal Kitab is available in this horoscope software. All Horoscope Models can be printed from this horoscope software. This horoscope software can be stored in a CD or DVD. You can make PDF file in single click. Various predictions- Navamsa, planet, house reading, matching, mahadasha, antardasha, gochar, varshphal and 30 year prediction etc are also given in this horoscope software.